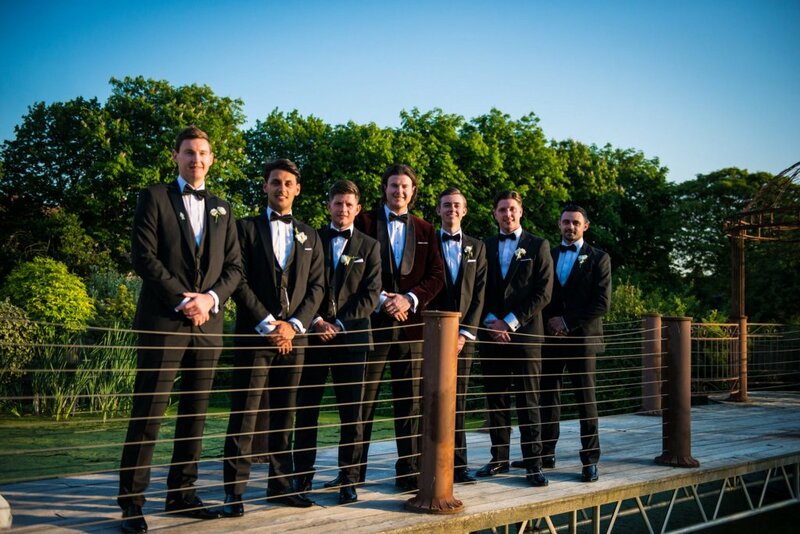 In recent years, dinner suits have become an increasingly popular choice for the groom and his groomsmen to wear on his wedding day. They undeniably add a sense of glamour and sophistication to a wedding, and can make the wearer look and feel great. For tips on how to wear a dinner suit with ultimate style, read on. Winter has traditionally been the wedding season of choice to wear a dinner suit, however, as they offer such a classic look, they can now be worn all year round. In our view, the season isn’t really an issue; the key thing to think about is how a dinner suit will work with your wedding venue. Black tie offers a very formal look, so it tends to work best when worn in grand hotels, castles, and stately homes. For inspiration, we’d recommend taking a look at wedding photos from your venue, so you can see how other couples have dressed when getting married there. The aim here is to look as far removed from your prom dinner suit as possible! The key, as with most things, is in the details. Whether you decide to buy or hire a dinner suit, making sure it fits your body shape is crucial. At Whitfield & Ward, our Dorchester dinner suit is available to hire in three different cuts to suit everyone in your wedding party. Should you decide to buy, we also offer a bespoke tailoring service, where you can design your suit from start to finish and guarantee an impeccable fit. A good quality dress shirt should always be worn with a dinner suit. Opt for a full collar with double cuffs and try to avoid wing collar shirts, which should be reserved for white tie dress code. If you really want to up the style stakes, we’d recommend a studded Marcella shirt, which we can tailor to fit you perfectly. A waistcoat adds an important layer of formality to any groom’s look, and will separate you from the rest of your wedding guests. And, if you choose a lower cut style, it will help to create a powerful V at your chest, while accentuating your shoulders. Keep it classic with either a horseshoe or V-shape waistcoat in a matching fabric. The most elegant way to finish your look is with a traditional black bow tie and crisp white pocket square. A patent dress shoe is also recommended – remember, no brogues or Oxfords! Take a look at our Pinterest board for inspiration. 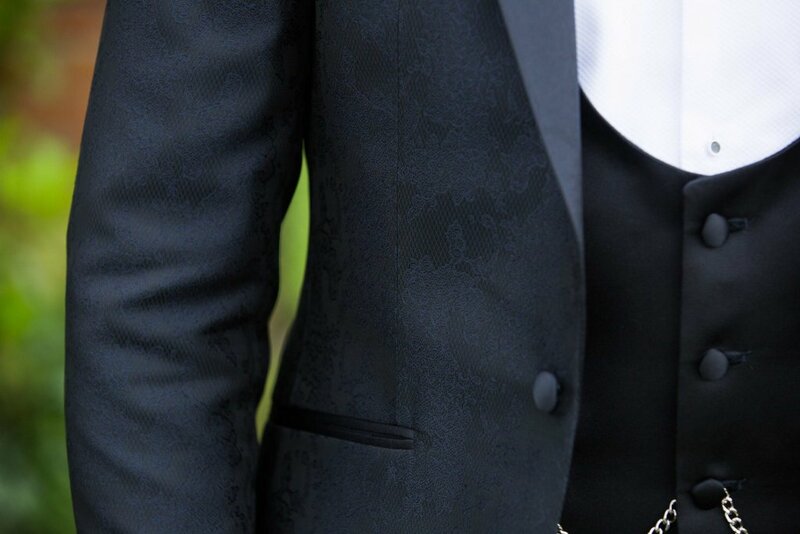 With black tie weddings, it’s the subtle details that will differentiate you from the rest of your groomsmen, such as the style of your waistcoat, a studded Marcella shirt, and a pocket watch. However, if you really want to make a statement, think about different colours and textures. Midnight blue dinner suits are a popular choice for weddings, however, bottle green and burgundy in plush velvets and jacquard prints can work just as well. 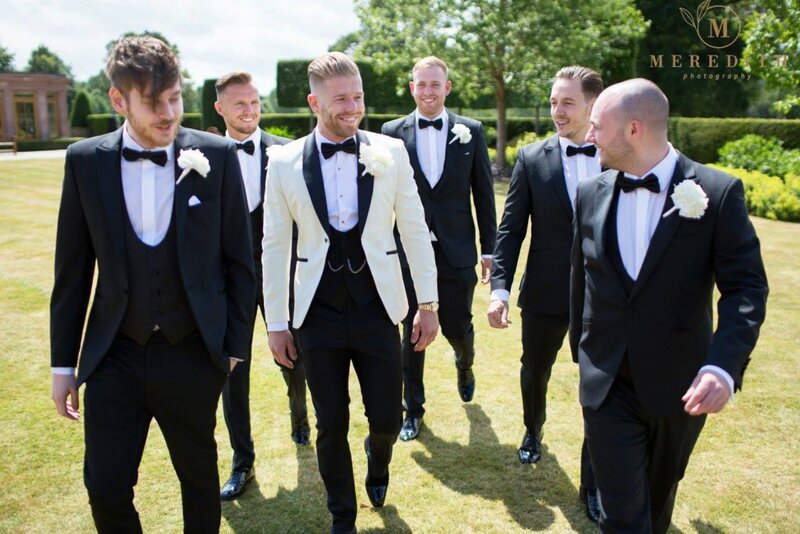 And, if you’re feeling really adventurous, a white dinner suit jacket will complement your bride and give you the ‘wow factor’at your wedding. The final thing you need to think about is the dress code; will all the guests be in dinner suits or just you and your groomsmen? A complete black tie wedding is ultra glamorous, it just depends on how individual you’d like to look. 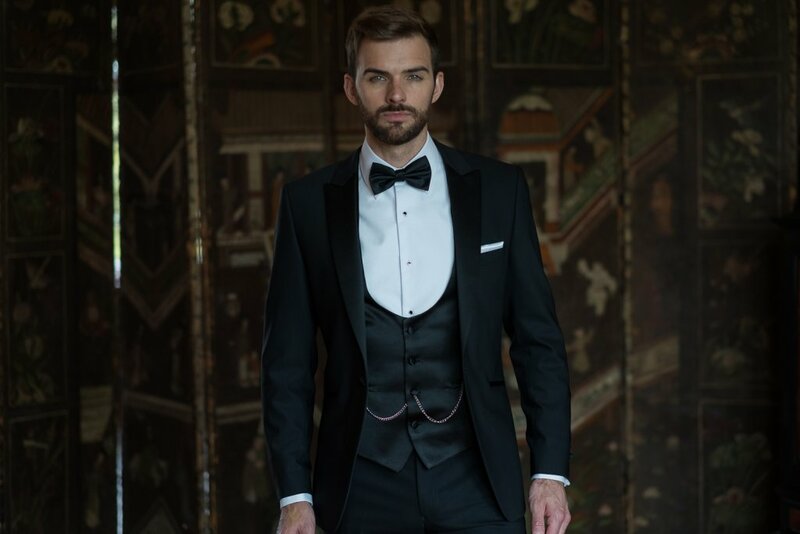 At Whitfield & Ward, we offer a combination of hire and bespoke dinner suits that will have you looking your absolute best on your wedding day. Give us a call on 01625 536 545 for your first styling appointment, and we’ll handle the rest.